Why buy this driver? The answer is simple: pure performance and quality. We design, assemble, and test these drivers in-house in the USA using the best components available for the job. We use only fresh, traceable high-qualtiy components from reputable manufacturers because we want these drivers to work great not only today, but in ten or twenty years from now. 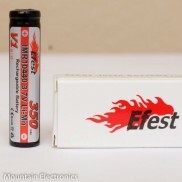 All boards are reflowed in a J-STD-020 compliant reflow oven using high-quality solder paste. 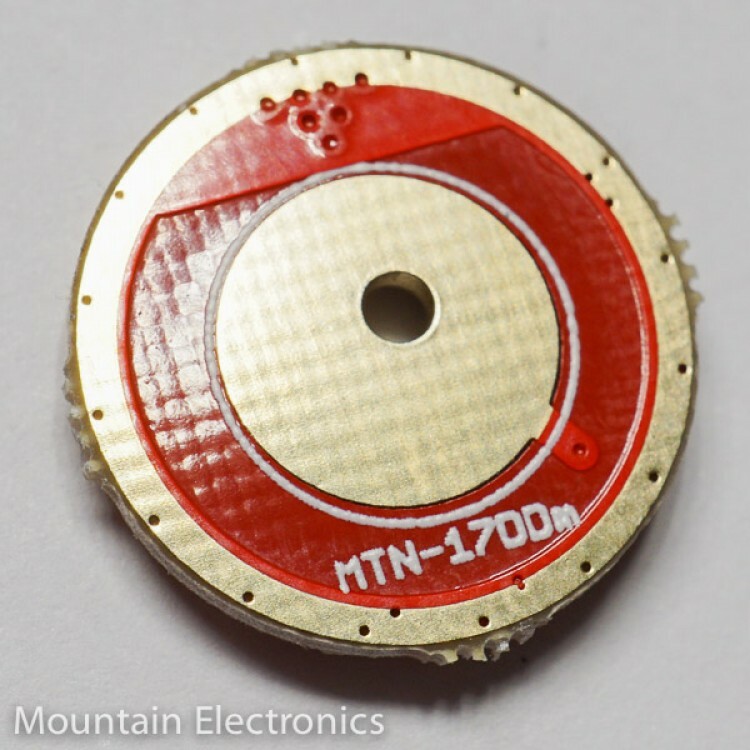 This driver gives you the best of both worlds: an ultra low resistance FET and a single 7135 linear regulator. 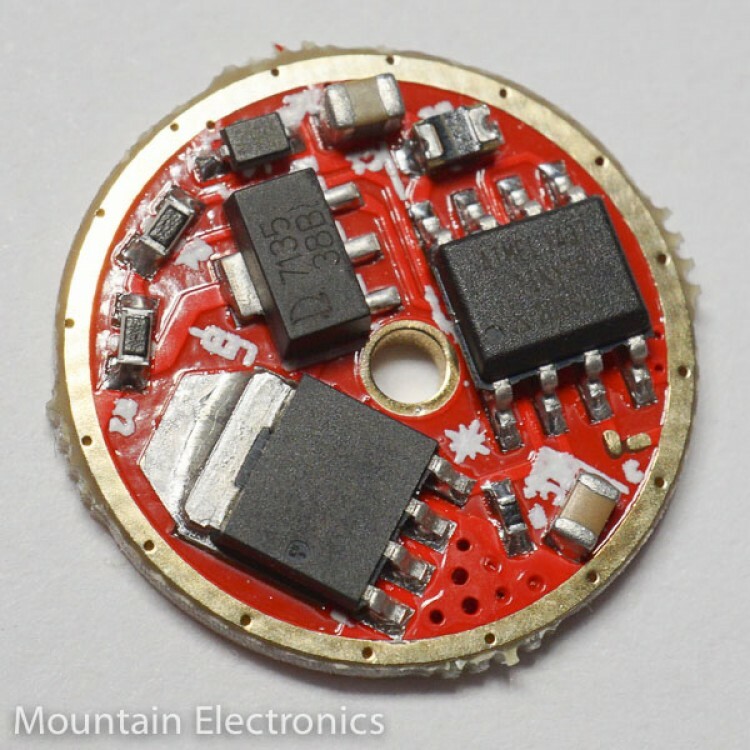 The 7135 gives an ultra-efficient moonlight and low mode, with the FET providing near-direct-drive performance (limited mostly by your battery, LED, and connections) on the higher power levels. All 17mm FET+7135 drivers now generally ship within 3 business days! This is the newest update of the guppydrv series by DrJones, now with more modes than ever and thermal protection! For more information, click this link. Please note that you set your own turbo timer / temperature sensor setting on guppy3drv. Once in configuration mode, the light will give a solid flash between 1 and 8 times. The number of solid flashes indicates the option number to be changed. To select/change the option turn the light off turning the strobing flashes that immediately follow the solid flashes. Simple mode. 3 modes only, with high at about half power. No moonlight mode, no memory, no medium-press reversing, and high is only about 50% power. Mode memory. Enable or disable. Moonlight mode. Enable or disable. Mode order. L-->H or H-->L (ascending or descending). Mode group. The number of flashes indicates the number of modes (excluding moonlight mode). Groups 1-6 are normal modes, with fairly even spacing between the modes; e.g., Group 1: 100% only; Group 2: 2 evenly spaced modes; Group 6: 6 evenly spaced modes. Medium-press. Enable or disable. This function enables or disables the ability to reverse modes and also to access the hidden modes. Thermal calibration. Once you enter this mode, the light will be dim for about 1 second, then go to full brightness. Once the light reaches the desired maximum temperature, turn the light off and the temperature level will be saved. To disable the thermal protection, turn the light off during the first ~1 second when the light is dim. Factory reset. Resets all options to their original states. ​You can download the Bistro firmware source code here. (Firmware from this source may be updated from time-to-time and may differ slightly from what you receive on your driver). ToyKeeper has been at it again! Crescendo is an awesome clicky ramping firmware with thermal control, among many other awesome features. For more information about this firmware and user interface, click here. Source code available here. Standard FET with Memory. This is the most popular option. Equipped with off-time memory, mode changes are intuitive and the light always picks right back up where you left off. Standard FET with No Memory. This is the second most popular option. Equipped with off-time no memory, the light will always start on the first mode level after being turned off. 3 reverses mode order from the standard ascending (low to high) to descending (high to low). Standard Clicky Firmware Low Voltage Protection. 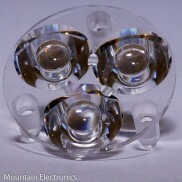 At around 3V under load, the light will blink three times then step down the power level. 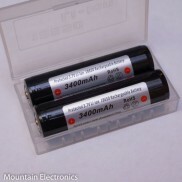 At around 2.8V under load the light will blink ten times then shut off. This system gives you ample warning and attempts to extend runtime before turning the light off. This firmware was created by BLF forum member ToyKeeper, and is a great option for your 7135+FET driver! You can download the source code for this firmware here. By default, no memory is enabled. Memory can be enabled via the configuraiton mode. To enter the configuration mode, rapidly turn the light off 15 times in a row. The light will then begin to blink in pairs of two blinks. In the middle of the second pair (the third blink), switch the light off. Memory will then be toggled on or off. By default, the driver has two mode groups built in. To change mode groups, rapidly switch the driver off 15+ times to enter the configuration group. The light will then blink twice, pause, then blink twice again. You want to switch the light off between the first set of blinks, which means that you want to switch the light off after the first blink you see. This firmware allows the ultimate in user customizability, with 22 built-in mode groups, that the user can select via a series of button presses and a user programmable turbo timer that will automatically step the power down to 50% after the set time is hit (see below for instructions). Low voltage protection: With 1S cells (non-zener mod) the light will begin to step down output at around 2.8v under load. The light will not shut completely off, but will continue to run at a moonlight level. Standard FET Electronic Switch. This is for use with an external electronic switch, where the driver is always powered, not for use with a standard clicky switch where power is cut by the switch to change modes. This option uses STAR momentary firmware, which allows you to start on either the lowest or highest mode from off with either a short tap or long press of the switch. One side of the switch is soldered to ground, the other to the pre-tinned switch pad on the driver (connected to pin 2). ​Standard Electronic Switch Firmware Low Voltage Protection. At around 3V under load, the light will step down the power level. 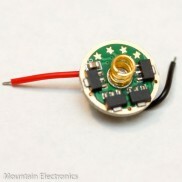 At around 2.8V under load the light will shut off. You can override any low voltage shut down by holding down the electronic switch button. This system gives you ample warning and attempts to extend runtime before turning the light off. D4 V2 Ramping. This momentary switch firmware gives you awesome ramping control, thermal throttling, and a slew of other features. For more information about this firmware and user interface, click here. Source code available here. A turbo timer may help reduce the chance of overheating. Bistro / guppydrv firmwares do NOT use a fixed turbo timer. 1. What Is The Input Voltage Range? 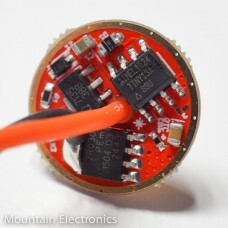 This is a "direct drive" driver, meaning it doesn't step up or down voltage that the LED sees. This driver can only be used with a single cells on the input (or multiple parallel cells) and a single XM-L2/XP-G2/XP-L/Nichia/etc. on the output (or multiple LEDs in parallel). The MCU (the computer that controls the driver) has a voltage limitation of 5.5V. This means that it can only be used with a single cell unless zener modified. 2. 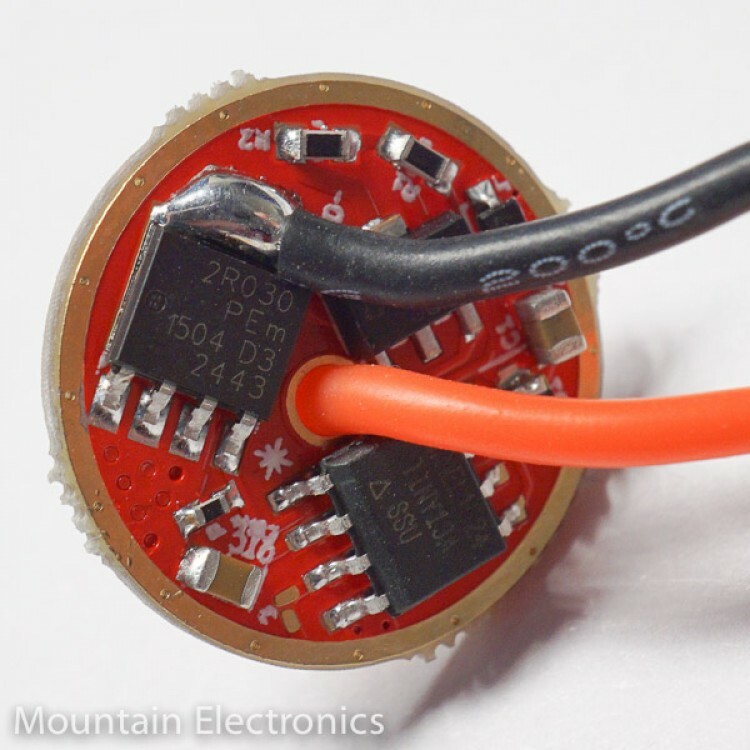 What Are the Downsides vs. A linear driver, such as the QLITE? No Regulation. The amount of light the higher modes put out will drop as the battery drains, where with the normal 7135 driver all modes will be regulated until the battery level drops below the point of regulation. Heat. While the driver itself doesn't produce very much heat at all (actually runs cooler than a 7135 driver), you need to be aware that not every LED and every setup can handle the heat and current from running direct dirve. Running more current also generally means shorter battery life. 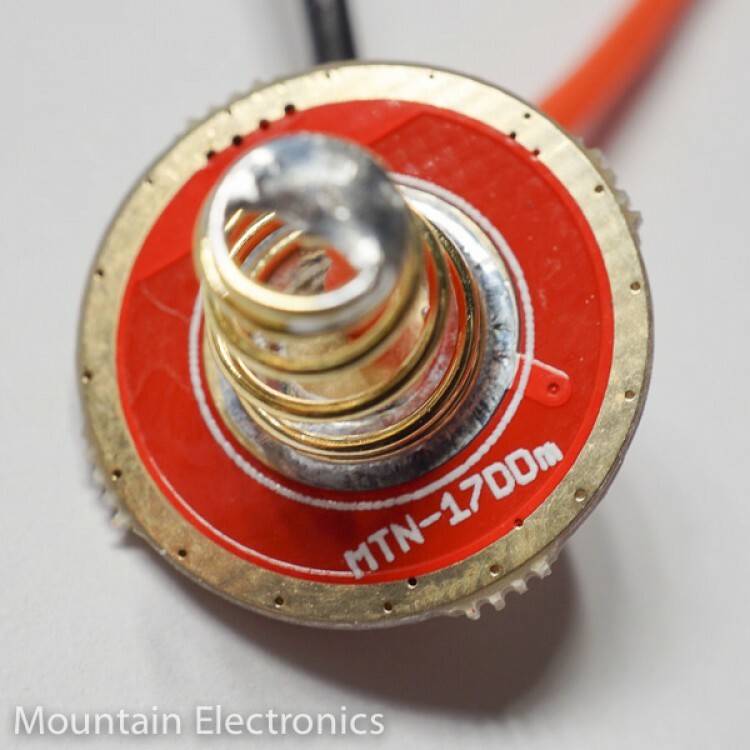 This amount of current can also melt switches and springs if they aren't up to the task. 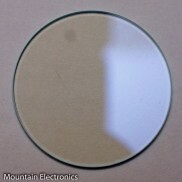 It also generally requires LEDs mounted on direct thermal path MCPCBs. 3. What Kind Of Output Can I Expect? Output is generally limited by cell selection, LED type, and other connections (such as springs and emitter wires).